Adrenaline Rush Obstacle Course Get ready for an intense adrenaline rush!! The original 360° obstacle course offers 80′ of challenges per lane including tunnels, log jams, crawl throughs, up and overs, rock climbs, slides and more!! Only one word can describe this course, AWESOME!! It’s a great item to have for competitive players, especially school and company events! 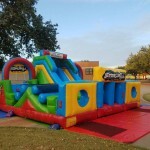 It is ready for your children’s Party, or event. 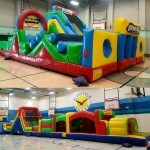 Rent one for your party today! Call now for your Dallas, Plano, Frisco, and all areas in between – we deliver on time every time!